In today's market there are a number of fine ("adult") rimfire rifles and many "popular priced" models from which to choose, as a quick perusal of the rimfire rifle reviews on the Product Review page will show. The great majority of these are small game hunting and plinking rifles and they need telescopic sights. Several prominent scope manufacturers have stepped forward to fill this need and the manufacturers represented here are among the best known and most widely available. This article is intended to compare a representative range of rimfire scopes in both fixed and variable power styles. In order to accomplish this, we amassed eight rimfire scopes from seven manufacturers. These included the Sightron SII 3-9x36mm AO (www.sightron.com), Leupold VX-II 3-9x33mm EFR (www.leupold.com), Burris Timberline 3-9x32mm (www.burris.com), Weaver Classic Rimfire 2.5-7x28mm (www.weaveroptics.com), Nikon Prostaff Rimfire Classic 4x32mm (www.nikonusa.com), Simmons .22 Mag 3-9x32mm AO (www.simmonsoptics.com), Bushnell Rimfire 3-9x32mm and 4x32mm models (www.bushnell.com). Most of these are variable magnification models, but fixed 4x scopes from Nikon and Bushnell are also included. It might be worth mentioning in this regard that 4x is about ideal for small game hunting with .22 rimfire rifles and a fixed power scope is usually lighter and more compact than a variable power model. A fixed 4x scope is thus often a better match in terms of size and weight for .22 LR hunting rifles. It can also offer superior optics compared to a similarly priced variable power model. The .17 Mach 2, .22 Magnum and .17 HMR cartridges shoot considerably flatter than the .22 LR and variable magnification scopes give rifles chambered for these cartridges the extra optical "reach" that occasionally may be required to take full advantage of their flatter trajectory. A scope in the 2-6x or 2-7x range seems about right for most .17 Mach 2 or .22 WMR applications and a 3-9x scope is an excellent choice for most .17 HMR rifles or .22 WMR varmint rifles. Heavy barreled .17 HMR varmint rifles are probably best equipped with dedicated AO varmint scopes in the 4-12x or 5-15x ranges, but such scopes are beyond the scope of this article. There is, of course, no hard and fast rule about such things. Gone are the days when almost all rimfire riflescopes came with ¾" or 7/8" main tubes and required special mounts/rings. All of the scopes compared in this article are built on 1" diameter (25mm) main tubes and therefore can use standard 1" mounting rings. They can be mounted to the tip-off grooves found on the receiver of most rimfire rifles or using standard (Leupold, Weaver, etc.) mount bases if the rifle is drilled and tapped to accept them. Also gone is the short (1.5") eye relief that was common in the rimfire scopes of our youth. These scopes boast the same 3"-4" eye relief found in centerfire riflescopes. In addition, these scopes all come with fully coated optics and some are partly (Nikon) or fully (Sightron, Leupold, Burris, Weaver) multi-coated. Some rimfire scopes are also strengthened against the "reverse" recoil of adult air rifles. At one time rimfire scopes were inexpensive, kid scopes intended for cheap .22 rifles, but that is no longer the case. There are still some inexpensive (and inferior) rimfire riflescopes, to be sure, but the models included in this article are suitable for use by adult shooters and hunters. Most are in the medium price class and cost as much as the scopes that hunters typically buy for their deer rifles. The best rimfire scopes cost as much as deluxe (four-star) centerfire riflescopes. What mostly separates rimfire and centerfire scopes these days is the distance at which they are focused to be free from parallax. Most rimfire scopes either have adjustable objectives (AO) that allow the user to focus the scope at any appropriate distance or are factory focused to be parallax free at 50 yards. The scopes included in this article that feature an adjustable objective for parallax correction include the Sightron SII 3-9x36mm AO, Leupold VX-II 3-9x33mm EFR and Simmons .22 Mag 3-9x32mm AO. Of the rimfire riflescopes included in this comparison, the Sightron and Leupold are premium priced scopes. Burris, Weaver and Nikon represent the middle price class. The low price class is represented by the Simmons and Bushnell models. However, the latter are still a big step up from bottom of the barrel economy scopes like the ¾"-tubed Tasco Rimfire 4x15mm riflescope. It is these "behind the scenes" factors, which are practically impossible for the average consumer to ascertain, that make the biggest difference in price and the performance/durability of a scope in the years to come. That is why the manufacturer's reputation, their good name earned over many years, is so important. It is the consumer's only real indication of a riflescope's inherent quality. The design of a riflescope is also important. All optical systems are by nature a series of compromises and some scopes offer better balanced performance than others. Factors to consider in addition to optical sharpness, light transmission and contrast include field of view, eye relief, windage and elevation adjustment range, adjustment accuracy and repeatability, eyebox latitude, mounting latitude, size and weight. Even the durability of riflescopes' external finish varies widely. We have found, for example, that Leupold's ultra-hard anodized finish is extremely scratch resistant and less likely to show mounting ring marks than most other brands. For this article we mounted these scopes on some typical rifles, adjusted them, zeroed the rifle/scope combination and then did some target shooting at the local rifle range. We used them enough in various lighting and weather conditions (from bright sunlight to rain) to become reasonably familiar with their optics, operation and to form a reasonably educated, if subjective, opinion. SII 3-9x36 AO. Photo by Randy Wakeman. We mounted the Sightron on a Henry Lever Octagon .22 Magnum rifle that we were in the process of reviewing at the same time we were working on this comparison. It had previously served with distinction on a .17 HMR Winchester Model 1885 Low Wall rifle. Generous spacing between the objective bell, adjustment turret and ocular bell makes mounting this scope easy on a variety of rifles. The Sightron, which is manufactured by Sightron's parent company in Japan, has very good optics that are fully multi-coated. The image seen through this scope is bright and sharp in the center with a noticeable (but not intrusive) decrease in resolution toward the edge of the field of view. Color correction is very good. Flare is well controlled by Sightron's proprietary multi-coatings. This scope is relatively insensitive to eye position and has generous eye relief, 3.5 inches to 4.2 inches, making it easy to look through even if your eye is not exactly in the "sweet spot." The coin-slot windage and elevation adjustments are accurate, repeatable and click in definite ¼ MOA increments. The adjustment range is a very generous 80 MOA and we found the adjustments to be accurate and repeatable. The field of view at 3x magnification is 33 feet at 100 yards. The adjustable objective allows parallax focusing from a very close 10 yards to infinity. The zoom ring is smooth and positive, yet has plenty of friction to prevent inadvertent magnification change. The "American" style eyepiece focuses by turning the ocular bell on fine threads and is locked in position by a knurled lock ring. Inside is a fine crosshair reticle that allows very precise aiming at small targets. This is a target type reticle, so fine that in dim light it can get lost in tall grass or tree limbs and leaves. A slightly heavier reticle would probably be better for general small game, if not varmint, hunting. The scope's matte black external finish is restrained and imparts a quality look. There is plenty of space for scope mounting rings between the ocular bell, adjustment turret and objective bell. The Sightron SII 3-9x36mm AO is an expensive rimfire scope, but it is also one of the best rimfire scopes on the market and a worthy companion to a deluxe rimfire rifle such as an Anschutz or Weatherby. It weighs 14.3 ounces and is 12.32 inches long (without the supplied lens hood), making it the longest and heaviest scope in this comparison, its only real drawback. Lens caps are not included. Sightron has earned an excellent reputation for efficient customer service. Our experience with the Sightron SII was 100% positive and it is highly recommended by the Guns and Shooting Online staff. Overall rimfire scope rating: A- (Excellent). Note: In 2008, Sightron updated the 3-9x36mm AO for inclusion in their SIIB Big Sky line, updating its optics and increasing its already excellent overall performance to even higher levels. VX-II 3-9x33 EFR Rimfire. Illustration courtesy of Leupold & Stevens, Inc.
We mounted our "Gold Ring" Leupold VX-II on another Henry rifle, this time a customized Golden Boy varmint rifle in .17 HMR. (You can read about this rifle in the Rimfire Guns and Ammo page article "Henry Golden Boy .17 HMR Scoped Varmint Rifle.") Like other Leupold scopes, the Rimfire EFR is easy to mount on most rifles using standard rings because there is sufficient space between the front bell, adjustment turret and rear bell to allow the scope to be positioned where the shooter needs it to be. Leupold's decades of experience in the scope business shows in their attention to such details. EFR stands for "extended focusing range" and the Leupold's front parallax adjustment ring (AO) is marked for the exceptionally wide range of 10 meters to infinity with little gold numbers. Both the adjustable objective and the zoom ring required considerable force to turn, but were smooth in operation. Rotate the entire ocular housing to focus the reticle to the eye in the "American" style. The coin-slot windage and elevation adjustments are accurate, repeatable and click in definite ¼ MOA increments. The adjustment range is 64 MOA and we found the adjustments to be accurate and repeatable. The eyebox is generous, as is the 3 to 4 inch optimum eye relief. This is an easy scope to look through. The front objective lens is recessed about 3/4" in the objective bell, which provides a sort of built in lens hood. The ocular bell is threaded to accept Leupold filters and accessories. Neither lens caps nor a lens hood are included, although they are available from Leupold at extra cost. Optically, the Leupold is sharp, contrasty and well corrected for optical aberrations. Color correction is very good. Flare is very well controlled by Leupold's multi-coatings. This Leupold scope and the Nikon Prostaff subjectively provided the best and clearest views of the target of all of the scopes compared in this article. Most of what we said about the Sightron SII could also apply to the Leupold VX-II 3-9x33mm EFR. The VX-II comes with a Fine Duplex reticle (other reticles are available through the Leupold Custom Shop) that is more visible in unfavorable viewing conditions than the Sightron's fine crosshair and is probably the best reticle on the market for general small game and varmint hunting. The Sightron's optics might be a hair brighter (it does have a larger objective lens), while the Leupold's matte black external finish is harder and more durable and Leupold offers a wide range of nifty alumina accessories. At 11 ounces, 11.3 inches in length and with a 33mm objective, the VX-II is shorter, lighter and smaller in diameter than the Sightron SII, which may be an important consideration since many rimfire rifles tend to be petite. At minimum magnification (3.2 x), it has a slightly wider (by one foot) field of view, 34 feet at 100 yards. Leupold pioneered the transferable lifetime guarantee and their customer service has the best reputation in the industry. You cannot go wrong with a Leupold scope and all Leupold riflescopes are made in the USA. Our staff was divided as to which of the two scopes (Sightron or Leupold) they preferred, but everyone loved both and we gave the Leupold VX-II 3-9x33mm EFR our highest recommendation. Overall rimfire scope rating: A (Excellent). Timberline 3-9x32mm Riflescope. Illustration courtesy of the Burris Company. This is the replacement for the Burris Compact 3-9x R/A (rimfire/air rifle) scope that we requested from Burris for this review. The Compact R/A line is being discontinued according to Patrick Beckett, media and marketing guru at Burris. The 3-9x Timberline is actually a compact centerfire riflescope intended for use on short action rifles; rimfires certainly qualify as short action rifles! Unlike the other rimfire scopes included in this article, the Burris Timberline is focused to eliminate parallax at 100 yards (rather than 50 yards), so it would be most appropriate for a .17 HMR rifle, rather than a .22 rifle. The 3-9x magnification range is well suited to a magnum rimfire rifle used for both small game hunting and varminting. Reticle choice is Ballistic Plex or the standard Burris Plex; we would prefer the latter for a rimfire rifle. 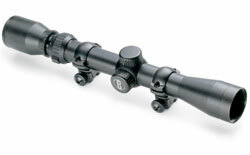 Like all Burris scopes, the 3-9x32 Timberline is built on a one-piece aluminum alloy main tube. This scope is a compact 10.3" long, but heavy at 13 ounces. The low, finger tip Windage and elevation adjustment knobs also offer coin slots, a belt and suspenders approach. The ¼ MOA, double spring force, internal adjustments are steel on steel and there is a somewhat limited 50 MOA of adjustment range available. We found the adjustments to be adequately accurate and repeatable. The zoom ring is heavily knurled and easy to grip, even when wearing gloves. Focus is by multiple rotations of the ocular bell and the adjustment is secured by a locking ring. The 100 yard field of view is limited to only 25 feet at 3x, which is about like the FOV of most scopes set at 4x, or about 25% less than average. On the other hand, eye relief is excellent at 3.75" to 5" and the view of the target through the Timberline is sharp and clear. Optical aberrations are well corrected, with only a little visible curvilinear distortion at the edge of the field of view. The internals are purged and dry nitrogen filled, then sealed using Burris "quad seals" (a special ring gasket with four lobes). Every scope is individually recoil, water and fog proof tested and protected by the Burris Forever Warranty. The physical design of the 3-9x Timberline puts the ocular bell very close (1.3") to the adjustment turret, which creates mounting problems on some rifles. Fortunately, most rimfire rifles come with receivers grooved for Tip-Off scope mounts that provide exceptional latitude for positioning scope rings. If your rifle requires conventional bases and mounts, the Timberline may not be for you. Check your rifle's mounting requirements before you buy. The Timberline 3-9x32mm is manufactured to Burris' specifications in the Philippines. 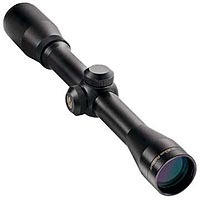 This scope's offers a wide zoom range, excellent eye relief, compact size, solid construction and an excellent warranty. Bear in mind that it is parallax corrected at 100 yards. Overall rimfire scope rating: B (Good). Classic Rimfire 2.5-7x28mm. Illustration courtesy of Weaver Optics. We mounted this sleek and attractive Weaver Classic Rimfire scope on the same Henry Lever Octagon rifle on which we tested the Sightron SII. Adequate space between the front and rear bells and the adjustment turret makes mounting easy. The Weaver's 2.5-7x magnification range was judged to be particularly appropriate for a .22 Magnum small game hunting rifle, while its 28mm objective lens and light 9.75 ounce weight (the lightest scope in this comparison) is a good match for this slender rifle. Overall length is about average at 11.5 inches. This Weaver scope is built on a one-piece aluminum alloy main tube and features a Dual-X reticle and fully multi-coated optics. This reticle is nearly identical to the standard Leupold Duplex big game reticle. Matte black and silver finishes are available. Our test scope is the all black matte version and the Weaver brand is identified only by a small green and gold oval on the adjustment turret, which gives the scope an understated, classy look. As befits a rimfire scope, its parallax correction is set for 50 yards. The optimum eye relief is 3.7 inches and the field of view is 41.3 feet at 100 yards at 2.5x. The coin-slot windage and elevation adjustments click in ¼ MOA increments and the adjustment range is a very generous 80 MOA. We found the adjustments to be adequately accurate and repeatable. The optics of this scope provided adequate resolution and contrast for small game hunting. It was not, however, as good as the Nikon, Leupold and Sightron scopes in optical performance. This scope's basic design is well thought out; there is plenty of room between the adjustment turret and the front and rear bells to correctly space the mounting rings. However, neither rings nor lens caps are included. Like other Weaver scopes that we have reviewed recently, the Rimfire Classic is a high quality product made in Japan. This scope offers a useful zoom range, wide field of view, generous adjustment range, light weight, mounting flexibility and solid construction at a reasonable price. Overall rimfire scope rating: B- (Good). Prostaff Rimfire Classic 4x32. Illustration courtesy of Nikon USA. This scope incorporates fully coated internal lens elements with multi-coated external lens surfaces (front and back) and is focused to eliminate parallax at 50 yards. The reticle is the Nikoplex, which incorporates a wider central "gate" than the original Leupold Duplex. It is a good reticle, but for small game hunting we wish that the outer areas of the crosshair were a little finer. Although sold as a rimfire scope, and excellent for the purpose, the Prostaff 4x32 is also eminently suitable for use on centerfire rifles chambered for revolver cartridges. We mounted it on a Henry Big Boy .357 Magnum rifle and were very pleased with the result. It was, likewise, a good match for the Big Boy's little brother, our Henry Golden Boy .22 Magnum rifle. The field of view is 11.1 feet at 50 yards and the optimum eye relief is a generous 4.1 inches. The windage and elevation adjustment range is a very generous 80 MOA and the coin-slot adjustment screws click in ¼ MOA increments. We found the adjustments to be adequately accurate and repeatable. The optics of this Prostaff scope are brilliant. It is very sharp, very contrasty and well corrected for optical aberrations, something that is easier to achieve in a fixed four power scope than in a variable power model. Color rendition is good. This is a nice scope to look through. Subjectively, it probably provided the best view of the target of all the scopes (when set at 4x) compared in this article. This Prostaff Rimfire is also a good looking scope, with a tasteful matte black finish and "Nikon" in small gold letters on the left side of the adjustment turret. The same scope is also available in silver and camo finishes. Focusing is "American style," requiring multiple turns of the ocular bell. There is a wide, knurled locking ring to retain the focus setting. The layout and design of the scope are conventional; there is plenty of room between the adjustment turret and the front and rear bells for positioning the mounting rings. This Prostaff scope is 11.2 inches long and weighs 12 ounces. Lens caps are included, as are a set of tip-off mount rings. This scope is not produced by Nikon in Japan, but rather made for Nikon in the Philippines, a country that is becoming a real force in riflescope manufacturing. For most of the staff, this Rimfire Classic 4x32mm scope represented our first experience with Nikon's popularly priced Prostaff line and we were very favorably impressed. Its optics are great and the price is moderate. Overall rimfire scope rating: B+ (Very Good). .22 Mag 3-9x32mm AO. Illustration courtesy of Simmons Outdoor Corp. This is alleged to be the best selling rimfire scope in the USA. The Simmons features a one-piece main tube, Truplex (Duplex type) reticle, TrueZero adjustment system, Quick Target Acquisition eyepiece (meaning a non-critical eyebox), target-type fingertip elevation and windage knobs that click in ¼ MOA increments and SureGrip adjustments. The windage and elevation adjustment range is 60 MOA and the click adjustments are satisfactorily accurate. The optics are fully coated, but not multi-coated, to reduce glare. Views of the target are good, better than expected for a scope of this modest price. Focusing the reticle to the eye is accomplished by a "European style" fast focus ring, a feature we appreciate. The somewhat critical eye relief is 3.75 inches and the FOV at 3x is 31.4 feet at 100 yards. Focusing the Simmons .22 Mag for the target range is by means of the adjustable objective, a useful feature for the varmint hunter. It will focus as close as 10 yards when set at 3x. This makes the scope a flexible choice for practically any rimfire rifle, from .22 Short to .17 HMR. Matte black and silver external finishes are available to match the finish of your rifle. Tip-off mounting rings are included in the price, a nice extra. Furthermore, there is sufficient space between the adjustment turret and the front and rear bells to position the mounting rings appropriately for most rifles. The scope weighs 13.2 ounces, making it the second heaviest scope in this comparison and it is 12 inches long. The Simmons 3-9x32mm AO's decent adjustment range, adjustable objective and many nice features make it, in our opinion, one of the best of the low priced rimfire scopes. It is covered by a Simmons' Limited Lifetime Warranty. Like the Bushnell Rimfire models that are its main competition, the Simmons .22 Mag scope is made in Red China. Overall rimfire scope rating: C+ (Above average). Our Bushnell Rimfire 3-9x32 was mounted on a Browning A-Bolt Medallion .22 LR rifle. If you are looking for a very economical, but serviceable, 3-9x variable power rimfire scope, the Bushnell Rimfire is a good way to go. We have used Bushnell Rimfire scopes (both the 3-9x32mm and 4x32mm models) so much over the years that they have become our reference standard for rimfire scopes, meaning that they arbitrarily represent the middle "C" rating. More deluxe scopes were awarded a higher grade and inferior scopes (of which there are many, although not included in this comparison) would be scored lower. The Bushnell Rimfire scopes are made in Red China. The Rimfire 3-9x32mm is built on a one inch diameter, one-piece main tube and there is sufficient ring space between the front and rear bells and the adjustment turret to accommodate most rifles and shooters. The fully coated optics are quite satisfactory. There is some loss of resolution as compared to the best rimfire scopes (or the Bushnell fixed 4x Rimfire model), but it is adequate for almost all small game hunting purposes and the variable power feature can be useful if varmints might be engaged at long range. The finger tip ¼ MOA windage and elevation adjustments are surprisingly accurate and make the scope/rifle easy to sight-in. The 40 MOA adjustment range is less generous than the other scopes included in this article. The scope is focused to be parallax free at 50 yards. Eyepiece focusing is "American style," in which the entire ocular bell is turned to focus and then secured by a lock ring and this 3-9x model has an easy-grip power change ring. The reticle is Bushnell's Multi-X, a copy of the standard Leupold Duplex that, considering the small size of likely targets, perhaps should be finer. Eye relief is three inches. The eyebox could be larger, but it is adequate as long as your eye is reasonably well centered behind the ocular. The Rimfire 3-9x32mm weighs 11.2 ounces and is 11.75 inches long, only slightly bigger than the top rated Leupold VX-II. You get more than your money's worth with the Bushnell Rimfire 3-9x32mm riflescope and tip-off mounting rings are included in the price. Overall rimfire scope rating: C (Average). This scope shares most features with the 3-9x32mm model described above, so the description is unavoidably similar. If you prefer a fixed 4x scope for small game hunting and cannot afford to spend a lot of money, this Bushnell Rimfire 4x32mm is definitely worth considering. We mounted ours on a CZ 452 .22 LR rifle using the supplied tip-off mounting rings without any problem. There is sufficient ring space between the front and rear bells and the adjustment turret to accommodate most rifles and shooters. The 4x Rimfire is built on a one inch diameter, one-piece main tube. The fully coated optics are not "best" quality, but they are entirely adequate for almost all small game hunting and they are somewhat superior to the optics of the Bushnell 3-9x32mm model at both center and edge. These Bushnell Rimfire scopes are not as bright and sharp as expensive rimfire riflescopes, but they work well in most lighting conditions. The eyebox could be larger, but is adequate as long as your eye is reasonably well centered behind the ocular. Eye relief is three inches, not generous, but sufficient for all rimfire calibers. Eyepiece focusing is by the "American" system, in which the entire ocular bell is turned to focus and secured by a lock ring. The finger tip ¼ MOA windage and elevation adjustments are surprisingly accurate for a scope at this price. The 40 MOA adjustment range is usually sufficient, but less generous than the other scopes included in this comparison; an area where Bushnell obviously compromised in the design of this scope. The scope is focused to be parallax free at 50 yards. The reticle is Bushnell's Multi-X, the same as is supplied in the 3-9x Rimfire. The Rimfire 4x model is slightly shorter and lighter than the variable power model; it is 11.5 inches long and weighs 10 ounces, making it the second lightest scope in this comparison. You get more than your money's worth with the Bushnell Rimfire 4x32mm riflescope. Like many "bargain priced" scope brands, the Bushnell Rimfire scopes are made in Red China, but unlike most, Bushnell has a solid reputation for standing behind their products. Overall rimfire scope rating: C (Average). In the case of these rimfire scopes, it turns out that price class is a good indication of performance. The high priced Sightron and Leupold scopes are the most refined and the overall best scopes. They are suitable for a wide range of applications (including centerfire rifles and target air rifles) and will last for many, many years, delivering excellent performance the entire time. If you own a deluxe rimfire rifle, you owe it to yourself to try these scopes. The medium priced Burris, Weaver and Nikon models are well made and, of course, they are more affordable to mainstream shooters than the deluxe scopes. The Burris Timberline would be a good choice for a .17 HMR rifle, the 2.5-7x Weaver Classic is one of the few rimfire scopes available in this very useful magnification range and the very sharp 4x Nikon is ideal for adult .22 LR rifles. Most serious rimfire shooters and hunters will be well satisfied with any of these scopes. The low priced Simmons and Bushnell scopes work better than their modest cost would suggest. For the shooter on a strict budget, they are a big improvement over iron sights. There are a great many inexpensive rimfire rifles out there and a lot of them are wearing Simmons or Bushnell scopes. So are some high quality adult rifles, like our Browning A-Bolt Medallion test rifle.